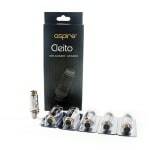 Pack of 5 replacement coils for the Aspire Cleio tank, these coils are made of Kanthal wire, Dual-Clapton build, with an organic japanese cotton wick and is available in 0.2 ohm (55-70w), 0.4 ohm (40-60w), 0.27 ohm (recommended with the Aspire K4 kit), as well as the new coils in stainless stell SS316 (singular not Clapton) 0.4 ohm for temperature control devices. In my opinion, the Cleito coils are the best manufactured coils on the market. Great vapor production and flavour, especially on the 0.4 coils.